Bacteria are often erroneously seen as a threat to our health, but that will soon change. The FluDoc is a personal test that uses genetically modified bacteria that are sensitive to human flu viruses. Just like the canary birds in the coal mines that warned miners of dangerous gases, the bacteria in FluDoc detect if you have the flu. Using the FluDoc is simple. 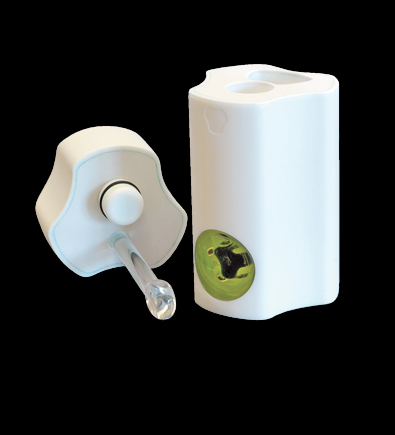 Put a capsule in the device, and use the rod attached to the lid to retrieve a saliva sample. Close the lid and wait a few minutes to see if the green light stays on. The FluDoc comes with several capsules that test for all the latest flu viruses.